The Food Travel Company recently asked me to test a recipe taken from a newly released cookbook. I had no idea what the book was since it was a blind testing, but I quickly worked out from the list of rather unusual ingredients that whoever the book’s author was they must live in or around the Bristol area. It transpired that the recipe was from The Ethicurean Cookbook. Opened a little over two years ago by four friends, The Ethicurean restaurant specialises in the use of seasonal ingredients that are ethically and locally sourced. This commitment can also be seen in the newly released book. Awarded the Observer Food Monthly Best Ethical Restaurant in 2011, closely followed by a Michelin Bib Gourmand award this year the restaurant is doing very well for itself. The Ethicurean Cookbook follows the team over the course of a year as they create new dishes paying attention to seasonality and the freshness of ingredients. The book presents 120 recipes that represent the best of British using produce grown literally metres from their kitchen door. 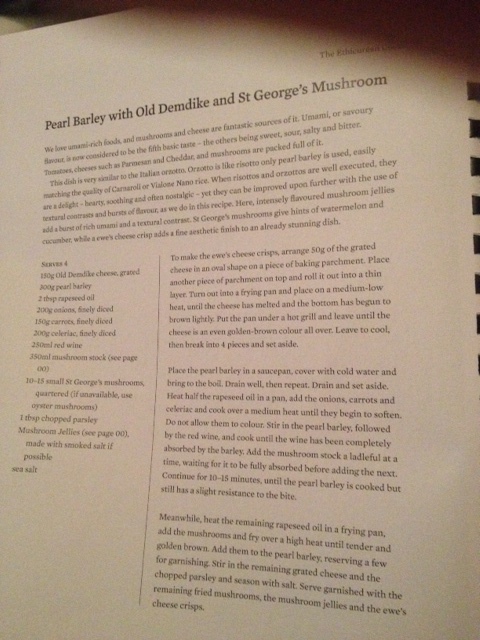 I was first asked to cook Goat Meatballs, Mash, Lovage Butter and Mustard Greens but found it impossible to source many of the ingredients so my next attempt was ‘Pearl Barley with Old Demdike and St. George’s Mushroom’. 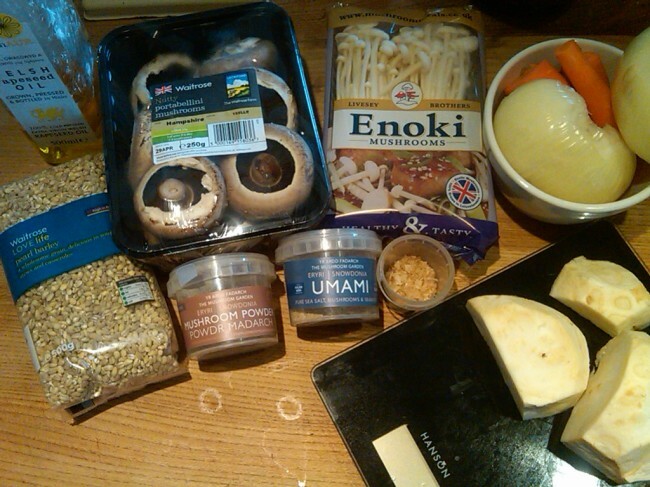 Again it was not possible to find all the ingredients so I had to adapt and make do. To read my full review go to The Food Travel Company blog including the substitutions I made. In the meantime I look forward to trying more recipes from the book; I see it as something of a challenge attempting to source all the amazing ingredients! As an addendum to the review; other tasters were less impressed with this dish. 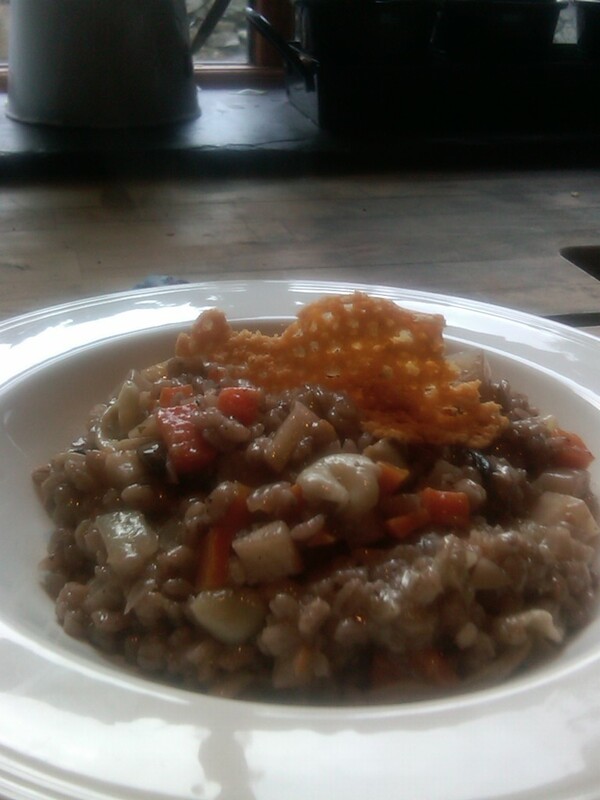 I think was in part due to a general dislike for pearl barley as a grain, although one taster suggested that although the dish was not unpleasant, it wasn’t something they would choose to eat again.